Plate 6 from the first set of Thomas Daniell's 'Oriental Scenery.' Of all the British artists who went to India in the 18th and 19th Centuries, it is Thomas and William Daniell who are the best known. Their work gives us a visual record of late 18th century India that no other source can match. 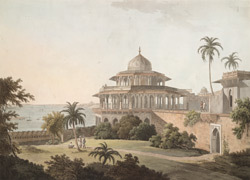 Some of their most important work shows buildings which have now vanished forever, even before the age of photography, such as this wonderful airy 'forty-pillared' pavilion perched on the wall of the Allahabad fort overlooking the river Jumna, constructed when the Emperor Akbar was building the fort in the 1580s.